Did anyone else N-O-T watch the Texas Shorthorns, Texas A&M Maggies, Texas Tech-Western Auburn University Red Taiters, and the Oklahoma Spooners over the weekend? Oklahoma State is “sooner” to join that list (because whatever big brother OU says, they do)…. I have no intentions to watch them, even when they play my beloved Wildcats of K-State. Ahhh the foul-smelling list that already includes Nebraska Cornsuckers and Colorado Duffalos just keeps growing. Why should we watch disloyalty football? Giving up on Saturday Football already? No way! But with the current state of mess at the NCAA and with all this “superconference” talk thrown about like a poorly schemed screen play, I think my study, thought, and enjoyment goes to the FCS teams around the country. They seem content to play football instead of banker. The long awaited, highly anticipated, absurdly accurate Limeyfish.com prognostications for 2011 Big 12 Football…or perhaps more appropriately named: The Longhorn League, The Small 10, The Little 12, The Beebe Ball Busted Conference…I could go on you know…..
That giant sucking sound you hear the in the Big 12 this year…it’s coming from south of Waco…it’s those Shorthorns taking the life (and fun) out of college football…it’s the Maggies trying to sneak out of here with their tailbone pad tucked between their legs…it’s U of You’ve Got To Be Kidding Me H hoping they get into this new minor league of college football that is taking shape. Oh yeah, SMU is annoying everyone by tapping on shoulder pads wanting some kind of deathly attention – I guess that’s sucking too, huh? The Fighting Sioux of the University of North Dakota! 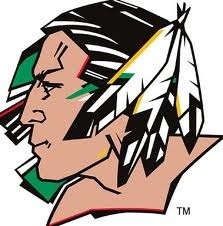 THE FIGHTING SIOUX OF THE UNIVERSITY OF NORTH DAKOTA!!! There, I said it…three times. I’ve also posted their logo. Oh Nooo! The NCAA and Big Sky Conference will probably threaten to sanction me now. Ahhh, probably not…I said it before the August 15th imposed mascot-change deadline so I should be OK.